This week I shall wax poetic over a recent 2015 memory of finding this centerpiece rather than the 20-year old memories detailed in previous blogs! 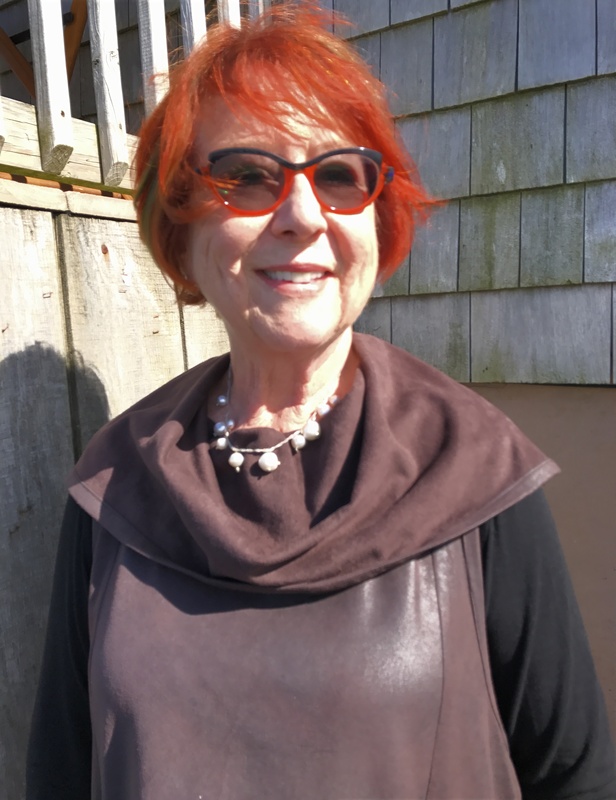 An inspiring friend, Nancy Cusack, now an Adjunct Professor Emerita at Mass College of Art and Design, Boston, and Visual Artist, invites her friends to unique events at the College. I was excited to attend the opening of an exhibit of broken/unused/unwanted jewelry recycled by Professor Joe Wood’s Jewelry class into chic new wearables! This brooch was so captivating that I immediately put it in my hand as I finished looking around. I knew it would make a fabulous centerpiece for a yet-to-be-determined necklace! 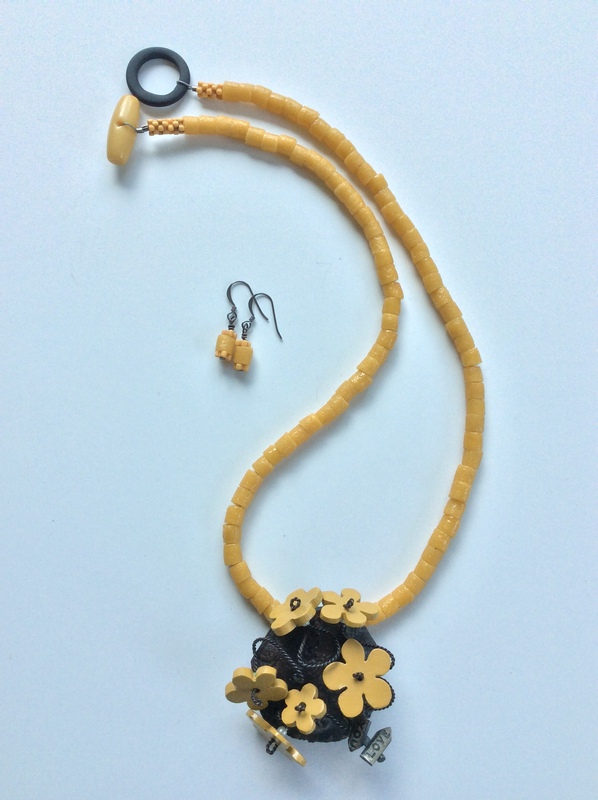 The beads accompanying the centerpiece turn out to be very simple: sand cast African glass from the yellow drawer with a hue so close to the flowers that they were destined to be together. These beads have been made in Ghana since the 1600s. In their unique process, pulverized glass is poured into a clay mold, with a local cassava reed placed where the hole should be. The mold goes into a furnace which heats it up to where it congeals, and the cassava burns away. 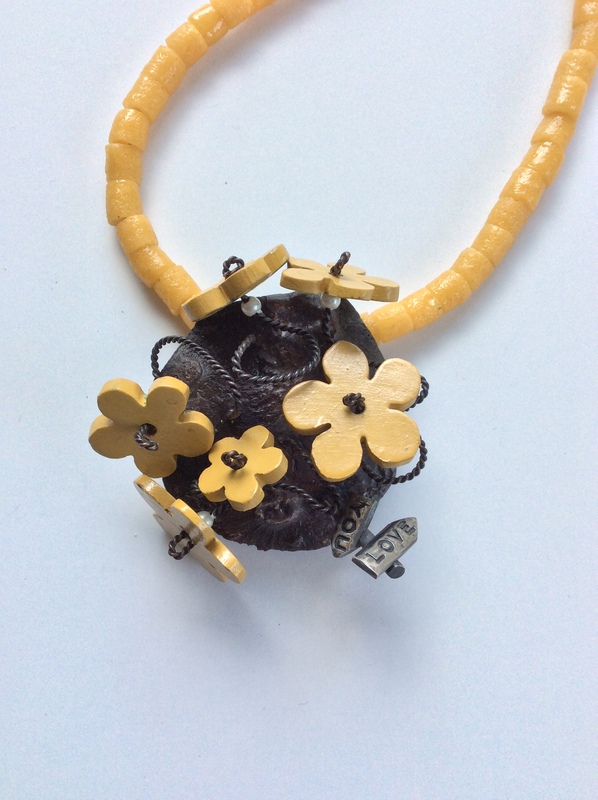 I also used a few interlocking flower disc beads, also made in Africa and used as trade beads (more on trade beads in blog dated February 8, 2017). Find them in the back of the brooch and at the end of the necklace. A fun clasp makes the back look good. A vintage resin button serves as a toggle to the black glass circle. Earwires are blackened silver with matching beads. The necklace is 21” long; the centerpiece is 1.5” diameter. $99 for set. Here is an image of one of my other purchases at the Recycled Exhibit—a clever repurposing of faux pearls studded with silver solder and attached to two intertwined chains. It has become my go-to daily necklace when I’m dashing out of the house and no time to choose one of my own creations. Also a quotidian! I loved the 2015 discovery story but am at a loss to connect the bead art with the title – “Moralist of the Quotidian”. It must be wonderful to be both an artist and literature major!! Well, perhaps it is time to let everyone know that there is only a karmic connection between the bead art and the title. Ten years go when I enjoyed reading the NYTimes, especially the weekly Book Review, I was so taken with their well-turned phrases that I started copying them down. When I finished a necklace, I would scan the lists for the words that related to the inner spirit of the necklace. I still work off that list. No additions to the list and almost 1000 necklaces named…some repeats.